In 1981, Dave Forbush turned the 80-acre family farm into a Nordic ski center by leasing the rolling, forested state land that surrounds much of it. This allowed him to design and build 40 kilometers of trails that come winter are groomed by the largest fleet Pisten Bully groomers in the state. Since then Forbush Corner has emerged as a small but unique ski center, a haven for amateur racers and active recreation skiers who gladly skip the glitz at night of the large ski resorts for the best groomed tracks during the day. 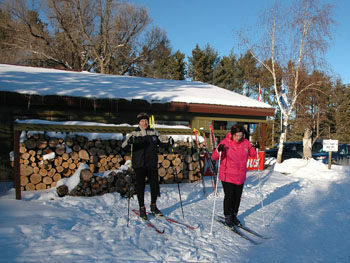 In 1981, Dave Forbush turned the 80-acre family farm into a Nordic ski center by leasing the rolling, forested state land that surrounds much of it. This allowed him to design and build 40 kilometers of trails that come winter are groomed by the largest fleet Pisten Bully groomers in the state. 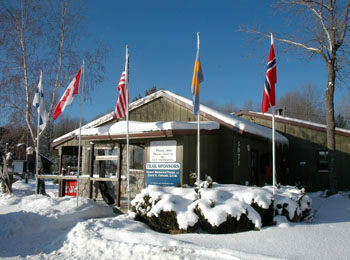 Since then Forbush Corner has emerged as a small but unique ski center, a haven for amateur racers and active recreation skiers who gladly skip the glitz at night of the large ski resorts for the best groomed tracks during the day. Grooming tracks for diagonal striding or packing a lane for skating means an almost effortless glide for advanced skiers. For beginners, tracks guide the skis, allowing them to concentrate on learning the technique rather then worrying about hitting a tree. The trail system at Forbush Corner is divided into two sections on each side of a Roberts Road; East Trail System and West Trail System. The East Trail System includes 18.2 kilometers of trails, including the popular but challenging Rollercoaster and Badlands trails, rated Most Difficult. Also on the east side is Lil Coaster, rated More Difficult, and Flatlands and Pancake trails for beginners. The well marked trails are laid so it is easy to begin on one and switch to another to add and reduce the kilometers of any run. The 11.5-km West Trail System includes two Most Difficult trails; Stinker and Screamer, along with Back Forty, a 4.5-km loop rated More Difficult, and the Green Trail a fun run for beginners or as a warm-up ski. 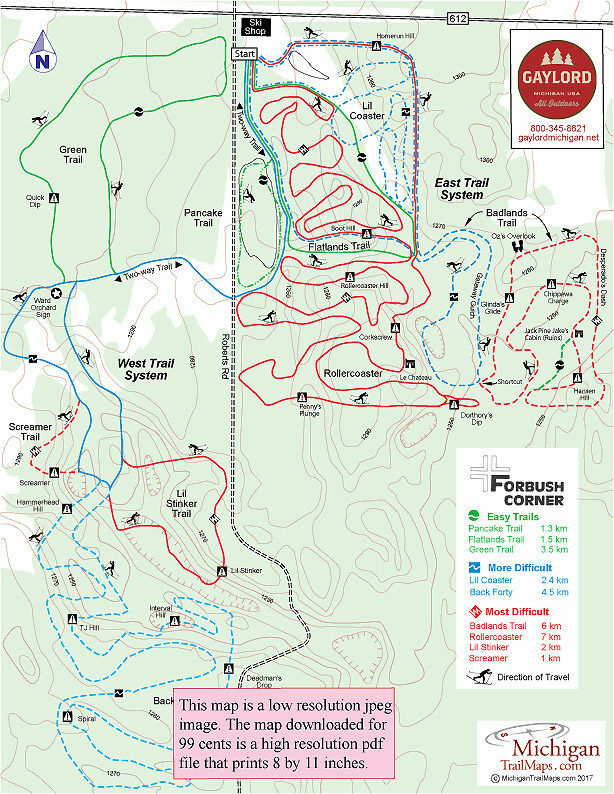 The longest outing at Forbush is what is referred to as the Perimeter Trail, a 14.5-km ski that includes the Easy-rated Pancake and Green Trails, the Back Forty of the West Trail System, the northern half of Rollercoaster, Badlands Trail and east half of Lil Coaster. 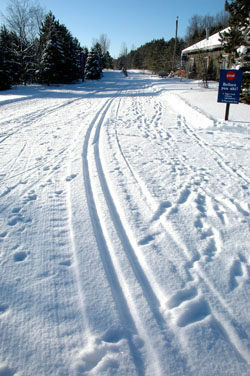 Winding through the middle of the East Trail System are 9 kilometers of marked snowshoe trails. 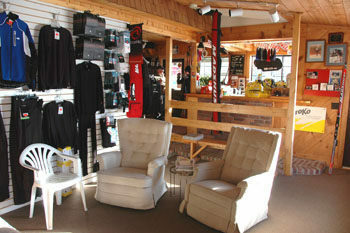 Forbush Corner also has a ski shop, Nordic lessons and on the weekends limited food service that include crock pots full of chili and homemade bread that can be enjoyed in one of two warming areas.